Wrought Iron bathroom accessories including towel rings, towel bars and toilet paper holders are attractive and are very functional. These handcrafted towel rings, towel bars and toilet paper holders add an authentic Victorian, Mission, Colonial or Country charm to your bathroom. When you are are ready to improve your bathroom, wrought iron bathroom hardware and accessories provide easy, instant and powerful results. Wrought iron makes for the strongest, most durable and unique bathroom hardware and accessories, including towel bars, cabinet hinges, knobs, pulls and toilet paper holders(these could be important). The value of quality, handmade wrought iron bathroom hardware and accessories is unsurpassed. You and your guests will cherish the authentic characteristics and unique individual markings on each piece – a true reminder of a blacksmith’s dedicated labor. Wrought iron is a timeless material that will enhance every aspect of your bathroom. Your bathroom can be improved with wrought iron hardware in many ways. Imagine an ornamental towel bar mounted next to your vanity or counter to match an elaborate wrought iron towel ring. Wrought iron bathroom accessories, including cabinet hardware and standing wrought iron shelves are often sought by the finest interior decorators looking to complete an overall rustic feel. Because bathroom hardware and accessories are subject to high levels of moisture from showers and tubs, they often gather mold. Wood surfaces, in particular, can be a breeding ground for mold and other bacteria. Attempting to clean and rid a bathroom of unhealthy germs can be a difficult task. When decorating and furnishing this important area of your home, it is crucial to seek out surfaces that are easy to clean. Wrought iron can be sanitized and repeatedly cleaned without fear of damage or deteriorating. Your beautiful wrought iron bathroom hardware will maintain its appeal for many years, while helping you to get rid of harmful germs and keep your bathroom clean. Towel bars serve an important function in the bathroom and they often create a focus for the room’s theme or style. Wrought iron towel bars add a unique design to any bathroom décor due to their authentic, one-of-a-kind nature. Wrought iron towel bars come in a variety of styles and sizes. Skilled craftsmen take pride in hand-forging wrought iron into intricate patterns, from rustic charm to modern styles. If you do not see what you want, you may special order a product to meet your specifications and design preference. Simple wrought iron towel rings can create a feeling of elegance and it’s important to find one suitable for your tastefully chosen hand towels. 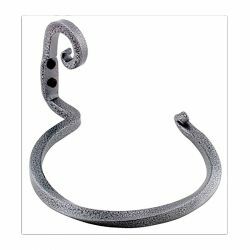 Wrought iron towel rings create a feeling of warmth and durability in any bathroom. Wrought iron towel rings are authentic works of art that are crafted by skilled blacksmiths who utilize the traditional method of hand-forging and are built to last for many years. When decorating a bathroom, don't forget about the toilet paper holder. Hand-forged, wrought iron toilet paper holders are functional, attractive and specifically designed to be noticed. A wrought iron toilet paper holder is the perfect accent piece for any bathroom and compliments your other wrought iron bathroom hardware and accessories. Wrought iron toilet paper holders are versatile products, designed to be functional as well as beautiful. 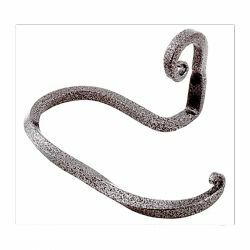 Wrought Iron Toilet Paper Holders come in a variety of shapes and sizes and are very easy to install.